NASCAR’s weekend at Auto Club Speedway started about as bad as it could. Friday’s qualifying progressed through the first two rounds with 26 entries eliminated. Leaving 12 cars and drivers set to run for the pole in the final round. The first superspeedway to host the Monster Energy NASCAR Cup Series with new competition rules in 2019 created havoc. On the 2-mile track, drafting proved significant in clocking fast laps. Everyone hesitated to be the first on the track for fear the rest of the drivers would follow use the draft to post a faster time. As the 5-minute clock wound down, everyone exited pit road at the same time. Unfortunately, every team miscalculated the amount of time it would take to reach the flag stand before the qualifying session ended. No one was able to clock a qualifying time. Drivers returned to pit road, climbed out of their cars to the boos of fans in the stands. A major black eye for the sport. Quick to respond to the controversy, NASCAR announced the field would be set by the recorded Round 2 results. NASCAR Senior Vice President of Competition Scott Miller spoke to the media that afternoon. Miller emphasized the organization does not want to back to single car qualifying. But, acknowledged changes will be made to avoid a similar occurrence at other tracks. Despite the controversy fans eagerly anticipated the expected race day action. 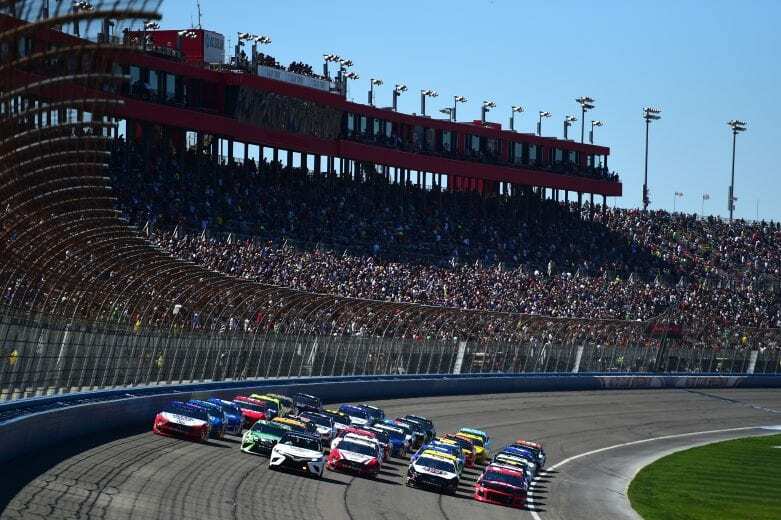 The Auto Club 400 runs 200 laps around the 2-mile speedway with stages set at 60/60/80 laps. Austin Dillon(3), the pole sitter, and Kevin Harvick(4) start on the front row. On the pace laps, the race cars lined up 5 wide to showcase the potential for side-by-side racing. Returning to the conventional 2×2 format for the start. Pole-sitter Austin Dillon had to take IV fluids before the race as he battle flu symptoms. Cole Custer stood by in case Austin had to exit the cockpit. As expected the field quickly fanned out 5-wide. Denny Hamlin(11) led the first lap from the 6th starting position. Position battles continued through the pack. Lead changes occurred multiple time per lap. Official lead changes are only recorded at the start/finish line. Aric Almirola(10) led for a while, trailed by Hamlin and Kyle Busch(18). It did not take long for the fastest car on the track, Kyle Busch, to move to the front. 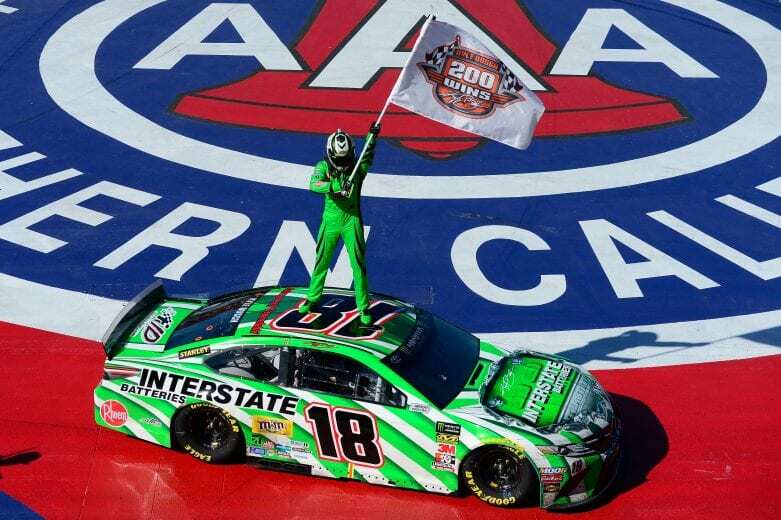 Busch dominated the first Stage taking the green and white checkered flag on what could be a momentous day for the Joe Gibbs Racing driver. At the start of Stage 2, the three Team Penske cars got together in an attempt to run down Kyle Busch. The hottest team on the circuit could not catch the leader. Green flag pitstops started at lap 31 for the race leaders. Just as in Stage 1, Kyle Busch was the last of the lead cars to pit. He lost no time on pit road, exited with the lead, even picked a second on 2nd place Brad Keselowski(2). Michigan’s Erik Jones(20) jumped up into the mix with the Penske drivers sitting in 3rd after his pit stop. Ryan Blaney(12) ran 4th and Joey Logano(22) 5th when everyone returned to the track. Jones seems to fade at the end of a 25-30 lap run. If he is near the front with a late caution, he may have a shot at the win. 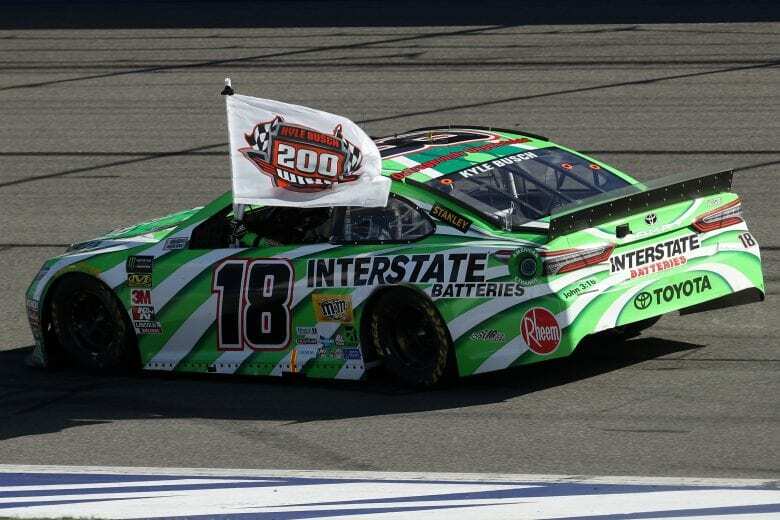 Kyle Busch continued to dominate as he swept both stages for the 3rd time in his career. Kyle Busch again was the first out of the pits. However, he was too fast exiting pit road. Will driver error ruin Kyle’s day? After returning to the pits to serve his penalty, Busch will start deep in the field. Keselowski inherited the lead, with Harvick, Blaney, Chase Elliott(9), and Almirola set to lead the pack into the restart. Busch took the green flag in 17th with 73 laps to go. With 63 laps to go, Kyle Busch worked his way back to the top 10. At 41 laps to go, Kyle passed his brother Kurt Busch(1) and moved to 5th. Pit stops began with 40 laps to go, giving the lead back to Kyle Busch. Bubba Wallace(43) blew a left front tire and exploded the fender. The debris from Bubba’s car brought out the caution with 38 to go. With the caution coming out during green flag pit stops, 14 lead lap cars had already pitted and were a lap down. Seven cars remained on the lead lap. Kyle Busch, Ricky Stenhouse(17), Keselowski, Blaney, Logano, Harvick, and Kurt Busch. As the leaders pitted, the cars one lap down took the wave around to get back on the lead lap. Blaney opted to stay out and was the leader when the race went green with 31 to go. Kyle Busch, Keselowski, Harvick, and Logano rounded out the top 5. The Ford Mustangs of Keselowski, Logano, and Harvick teamed up and moved to the front. While the Busch brothers fought it out for 4th. But as soon as Kyle established the position he made short work of returning to the lead. Kyle Busch drives away for his 53rd Cup Series win and 200th career victory combined in NASCAR’s top 3 series. An accomplishment that is sure to bring comparisons to Richard Petty’s 200 Cup Series victories. While coming away without a win the Blue Oval Ponies acquitted themselves very well. Mustangs took the 2nd through 5th positions and 5 of the top 10 spots on the day. While still early in the season Ford Performance is off to a fast start. Holding 7 of the 16 available playoff spots. With Daniel Suarez(41), just 5 points out of 16th position. Next week the series returns to its roots with the first short track race of the season. Martinsville Speedway hosts the STP 500, Sunday afternoon, 2:00 pm.